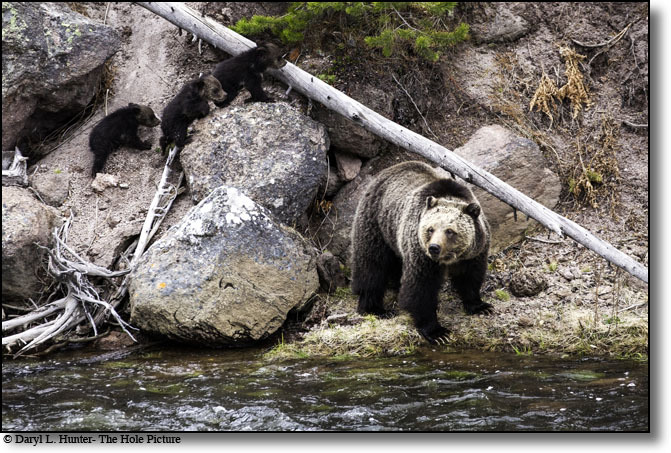 A Yellowstone Grizzly Bear sow and her three cubs along the Gibbon River. 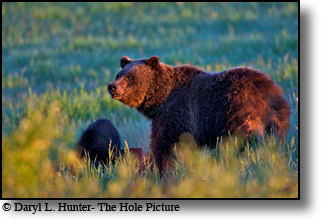 Grizzly Sow #610 glowing in the morning sun. The Yellowstone Grizzly Bear, once an endangered species, is on the rebound. The once ubiquitous Yellowstone Grizzly was as synonymous with a trip to Yellowstone as the obligatory pilgrimage to Old Faithful. Today it requires more luck to spot a grizzly. My tour clients always ask: Are we going to see any grizzly bears, and the reply is – we have about a 5% chance f spotting them. The chances of seeing them on my wildlife safaris are much greater because the concentration of the trip is wildlife to the exclusion of geysers and waterfalls. 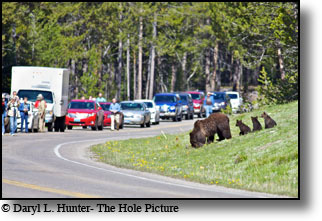 Bears were once commonly observed along roadsides and within developed areas of Yellowstone National Park. Bears were attracted to these areas by the availability of human food as handouts and unsecured camp groceries and garbage. Although having bears readily visible along roadsides and within developed areas was very popular with the park visitors, it was also considered to be the primary cause of an average of 48 bear-caused human injuries per year from 1930 through 1969. 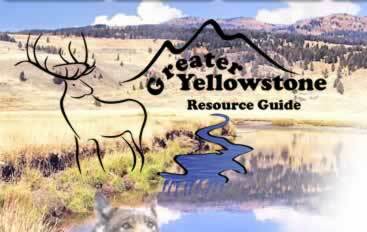 In 1970, Yellowstone National Park initiated an intensive bear management plan with the objectives of restoring the grizzly bear and black bear populations to subsistence on natural forage and reducing bear-caused injuries to humans As part of the bear management program implemented in 1970, regulations prohibiting the feeding of bears were strictly enforced, as were regulations requiring that human food be kept secured from bears. In addition, garbage cans were bear-proofed and garbage dumps within the park were closed. The results were disastrous for the existing grizzlies in Yellowstone as most died of starvation as they didn’t know how to find natural food; however, the 150+ surviving bears figured it out and survived. 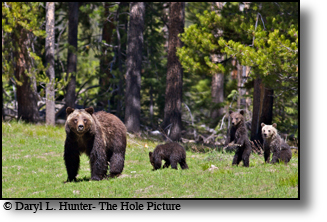 These survivors taught their cubs too live off natural food, and now we have a thriving population of grizzlies in Yellowstone that avoid humans instead of seeking them out. Due to the success of the recovery of the grizzly, they have been removed from federal protection for Greater Yellowstone Ecosystem. If removed from threatened status under Endangered Species Act (ESA), Idaho, Montana, and Wyoming would assume management responsibilities from federal wildlife officials and have greater flexibility in dealing with grizzlies. When removed from the threatened species list the grizzly will still be protected within the 2.6 million acre Grand Teton and Yellowstone National Park corridor. The Grizzly Bear once inhabited almost all-western North America but with the arrival of the Europeans in the 1500's their numbers were reduced until now they are restricted chiefly to the Canadian Rockies and Alaska with a small, healthy, and growing population in the Yellowstone Region. Grizzly numbers were estimated at 100,000 in the lower 48 states in the early 1900's, but today there are fewer than 1,000. Grizzly bears are still common in the mountainous regions of western Canada and Alaska; a population estimated at 30,000 bears. Grizzlies occupy a variety of habitats including the desert's edge, boreal forests, sub-alpine meadows to the tundra above tree line. Grizzlies were common on the Great Plains prior to the arrival of European settlers and in the 1700’s grizzlies numbered 20,000 in California alone. Grizzly ranges overlap extensively, and there is no evidence they are territorial. Occasionally, bears may gather in large numbers at major food sources and form family foraging groups, but grizzlies are generally solitary. 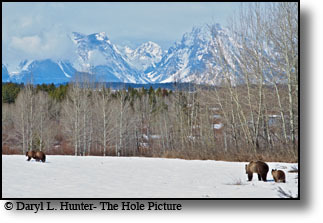 The GYE and Montana’s Bob Marshall/Glacier National Park Wilderness Complex are home to grizzly populations considered sustainable. The next goal for many in the grizzly bear recovery field is the Selway-Bitterroot Ecosystem. This would create a wildlife corridor that would enable bears to move between the three ecosystems, strengthening all three populations. The long-range agendum behind the environmentalist’s effort to move grizzlies into the Selway-Bitterroot ecosystem is a part of a movement to develop a corridor that could link populations of bears all the way from Alaska to the Greater Yellowstone ecosystem. 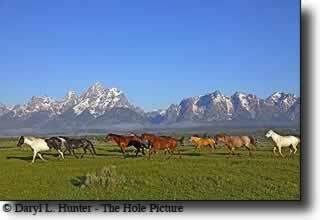 The idea has been coined Y2Y (Yukon to Yellowstone.) The Y2Y movement is 140 environmental groups who propose a series of wildlife corridors to link populations of bear, wolves, and other large predators all the way from Yellowstone National Park in Wyoming to Canada's Yukon Territory on the border of Alaska. The entire area encompasses almost 500,000 square miles, using dedicated, animals-only overpasses and underpasses. The grizzly bear has the reputation of being the most dangerous animal in North America and although its ferocity is well documented the most dangerous animals are the ones that we think are not, like moose and bison. Although real danger of attack by a grizzly is minimal as grizzly bears attempt to avoid human contact and will not attack unless startled at close quarters with young, engrossed in a search for food or protecting a kill. Although grizzlies try to avoid contact with humans, when encountered they are unpredictable and should be given plenty of room. Because of their size and aggressiveness towards threats, grizzly bears have no natural enemies but man. Humans have killed grizzlies throughout history for food, sport, and self-preservation; cubs may be attacked by other bears, mountain lions, or wolves, although this is very rare. 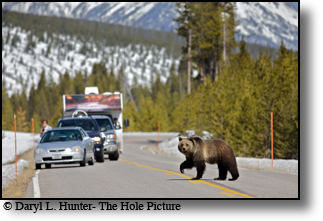 A grizzly bear known as Porcupine crossing the road in Yellowstone National Park. Grizzlies vary widely in body shape, color. The tundra grizzly is often yellowish on the back with brownish legs and belly. In the Rocky Mountains, the “ silver-tip” is dominant. Adults Rocky Mountain Grizzlies average 350 pounds at maturity. The coastal Grizzlies of Canada and Alaska and reach 1,100 pounds because of their abundant diet of salmon. Grizzlies move with a slow, lumbering walk, although they are capable of moving very quickly and can reach 35 miles per hour on short bursts. Grizzly bears reach sexual maturity between 4-6 years old, but they continue to grow until they are ten years old. Bears have been known to live and reproduce in the Greater Yellowstone area until 25 years old and have a potential lifespan of 50 years. A grizzly sow often has two cubs that stay with grizzly sows for two and sometimes three years. Grizzly cubs are born blind and furless while the sow is hibernating during winter, weighing only three quarters of a pound to a pound and a half at birth they grow to an average weight of 60 pounds by six months old. 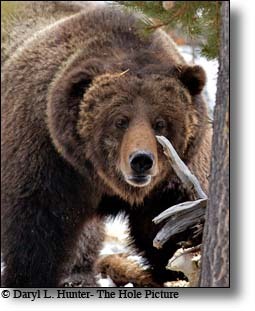 Grizzlies begin hibernation in October to December, and they come out of their den in March to May. Grizzlies dig their own dens and make a bed out of dry vegetation. Dens are usually located on a sheltered slope, either under a large stone or among the roots of a mature tree. Dens are sometimes used year after year. Grizzly bear numbers have dropped dramatically since the turn of the twentieth century, since settlers moved into the American West, driving these bears out of much of their former range. Grizzlies now occupy two per cent of their former range. Logging, mining, road construction, resorts; subdivisions, golf courses, etc. have all encroached on suitable grizzly bear habitat, resulting in a decrease in numbers. Finding and photographing grizzly bears and wolves around Yellowstone is one of my biggest thrills, and I spend a disproportionate amount of time doing so much the detriment of many of my other projects. 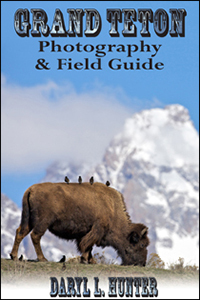 Sharing my knowledge with Yellowstone visitors not only enables me to spend more time photographing in the field, sharing this resource with the public helps the grizzlies in the political arena as most who encounter them become an advocate for them. 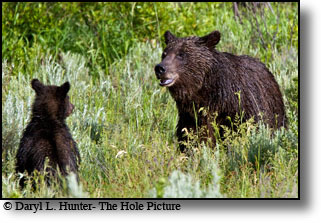 They need our help as Montana, Idaho and Wyoming are lying the groundwork for the hunting of the bears you see above. GRAND TETON NATIONAL PARK - Beloved and famous Grand Teton Grizzly Sow 399 and new set of triplet cubs made their debut on June 5, 2011 to the delight of many, but especially to Jackson Hole and Yellowstone's cadre of wildlife photographers like myself. 399 the four-hundred-pound grizzly acquired her unimaginative moniker in 2001 when, as a five-year-old sow, she was trapped and fitted with a radio collar so researchers could track her. Bear 399 was born to a mother who had no history with the legendary Yellowstone Grizzly Bear Study Team that tracks bears across the landscape. During the summer of 2004, 399 emerged from her den with a single cub, but the cub disappeared. It is assumed it had a deadly encounter with an adult male grizzly which are known to kill cubs. Male grizzlies are the greatest treat to cubs, as female grizzlies will not come into heat as long as they are nursing cubs.